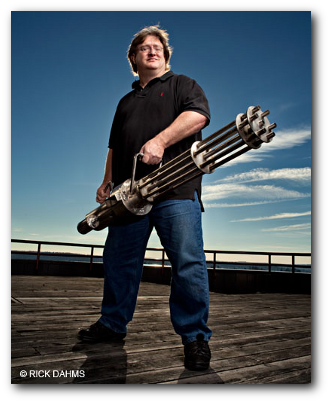 Gabe Newell at Valve is infamous for replying to emails. Having previously featured articles on this blog from developers such as Mainly About Games, and NimbleBit on their ethos with user research in games, and the practicalities of implementing it, I thought I’d have nothing to lose from emailing Gabe for Valve’s unique perspective. I write a blog about User Research in games, and know that play-testing, and incorporating player insight, is a huge deal at Valve. I was wondering if you could give a couple of sentences on your own opinions as to why user research is an important part of the game development process, and how you do this at Valve. While I’m making wishes, I’d also like a motorcycle, and a picture of you in a cowboy hat. If not, just the sentences will be great! “We start playtesting as early as we can—as soon as we have something playable. We’ll start with internal folks and then bring in external folks soon after. Yeah, it’s a great example of how the methods used throughout the design process are not expensive, and should be available to anyone – even without Valve’s budget!